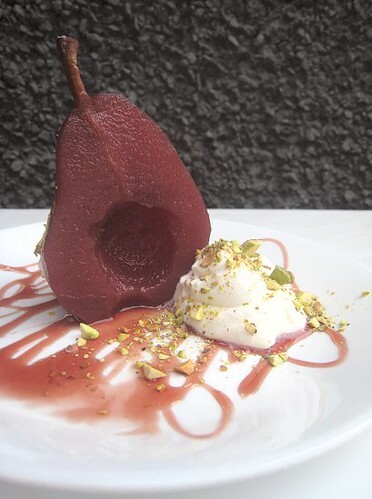 But, for some reason or another, I got it in my head to make poached pears for our father's birthday gathering last month. It seemed like a radical dessert dish for our gathering. We wondered, "Would our guests 'get' it? Or would they long for the more common cakes and such?" Well, once I get something in my head, sometimes it's hard to let go. I was determined to make them. I mean, look, they're so elegant! 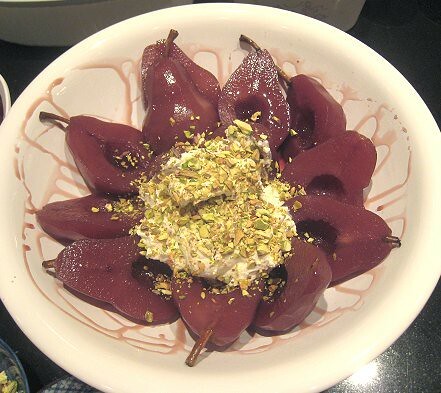 We all know elegance in presentation is not my strong suit, but these poached pears are elegant all on their own. 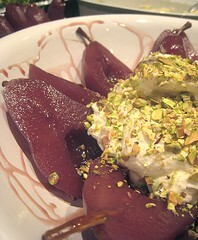 I poached the pears about 2 days in advance, because I wanted them to take on a darker, deeper hue. I liked making this because it was a dump-into-a-pot dish! Into a huge pot went some red wine, water, sugar, cinnamon sticks, a vanilla pod, some black peppercorns and a few cloves. I heated the poaching liquid until the sugar dissolved. I placed peeled, halved and cored pears into the pot and let them poach over low heat. I had to put a plate on top of the pears and weigh it down to keep the pears submerged. Since I used 15 pears, it took quite a while to cook. I tested the pears with a paring knife from time to time. When they were easily pierced (but not too soft or mushy), I turned the heat off and let them cool in the liquid. When the pot and its contents were back to room temperature, I shoved the whole thing into the refrigerator. There they stayed for 2 days until the party. To make the red wine syrup, I simply reduced a little bit of poaching liquid until syrup consistency. See the difference in color after the pears sat in the poaching liquid for two days? 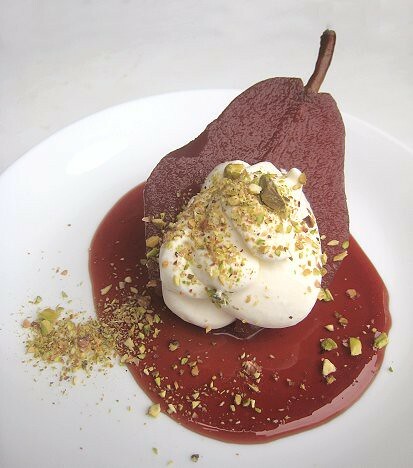 We served the poached pears with its red wine syrup, whipped cream, and roasted and ground pistachios. We needn't have worried. The pears were a hit! It was a perfect light dessert for our father's very hearty birthday party menu. After all the pears were eaten, I was still left with a lot of poaching liquid, which I put into the freezer. Now, what can I do with it, besides poach more pears? Any ideas? Pears can be kept whole or halved. Poaching liquid makes enough to poach 15 pears. Recipe for poaching liquid can be halved. In a large pot, place all poaching liquid ingredients and heat over medium heat. Once the sugar has dissolved, turn heat to low. Place the peeled and cored pears into the pot and cook until a paring knife pierces them easily, but don't let them soften too much. One may need to weigh down a small plate on top of the pears to keep them submerged while cooking. 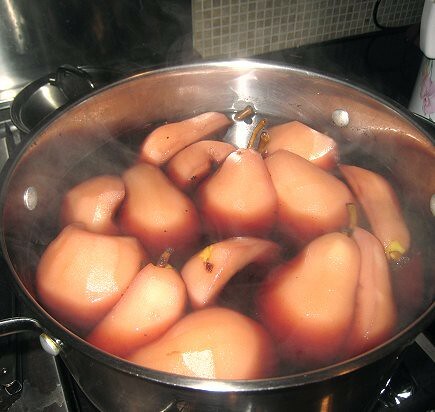 Turn off heat and let pears cool in the poaching liquid. When at room temperature, place pears in liquid into the refrigerator and chill. The longer they stay in the poaching liquid, the deeper and darker color they will have. Ladle some of the poaching liquid into a small pot. Heat over medium to medium-high heat until reduced to a syrup consistency. 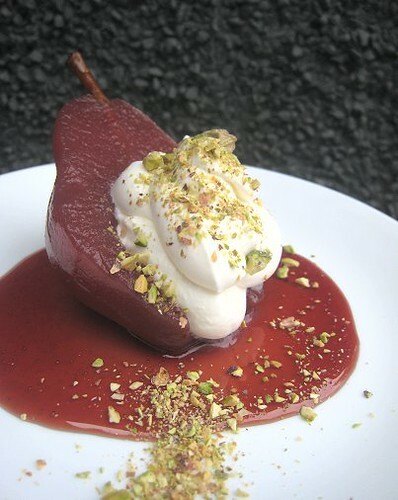 Served chilled poached pears with red wine syrup. If you wish, also serve them with whipped cream, or softened & sweetened cream cheese, or zabaglione. Granita sounds good. And very intrigued about adding a little to stews. The liquid is kinda sweet, though, but I think just a tiny touch of sweetness would be good in stews. Thanks for the ideas!